We’re just a couple days away from Thomas turning three months old and I can’t believe how time has flown. Well, maybe that’s a bit of a stretch. The weeks are flying by that’s for sure, but those middle of the night feedings are still something else. My sleep deprivation is not as bad as it was those early weeks when it felt like a horrible combination of being drunk and hungover at the same time, along with feeling like someone was pounding my head with a hammer while I was underwater. After not being able to stomach the sight and smell of coffee during most of my pregnancy, I’ve welcomed it back in my life with open arms. Coffee, I promise I will never leave you again. Besides sleep deprivation, the early weeks with Thomas was tough because he refused to sleep in his bassinet right when we got home. Trevor and I resorted to taking shifts of staying up and holding him at night while the other person slept. This lasted until the second week of April when he finally decided that the bassinet was not a scary place to sleep during the night. If you follow me on Instagram and see my Stories, you’ll notice that we’re currently struggling to get him to stay asleep in his crib or bassinet for his daytime naps. Everyone has been reassuring me that this too is just a phase and he’ll grow out of it and decide napping in his crib is okay too. Until then, I’m trying to enjoy the snuggles as much as possible. I’m also in shock and awe over how much he’s grown since we brought him home and looking back at photos from when he was a tiny little squishy baby makes me want to hug him all the more. So while I’m not able to get much done during the day in terms of cooking and cleaning, I’m coming to terms that the dishes and laundry will always be there, but my son will only be this small for a short period of time. Another thing that was difficult during the first month was getting Thomas back up to his birth weight. He ended up being a slow, sleepy eater and our first month was spent with multiple visits to our family doctor, the lactation consultants at the hospital I delivered at, and a few pediatricians all over the city to determine why it was taking him so long to gain weight. I expected breastfeeding to be difficult in the beginning, but nothing prepared me for the weight issues we faced or the feeling of despair and helplessness when we were being told the minuscule amounts he was gaining. It took a lot of waking him up to feed, scheduled feedings, and bottle top-ups, but we finally started making major progress at the three-week mark. After consulting with my friends and coworkers, I now realize how common this is with new babies, even though at the time it felt very isolating and that I was already failing as a parent. At his two month appointment, we were told that Thomas was at a good percentile for his age and now I’m enjoying his chubby little cheeks and chunky little baby legs so much. When we were trying to get Thomas back up to his birth weight, I searched the internet high and low for some quick and easy lactation recipes to keep my milk supply up, as I was both breastfeeding and pumping to keep up with the insane feeding schedule and the top-up bottles. Prior to going on leave, I made a couple batches of lactation cookies on a whim and stuck them in the freezer but I ended up depleting my stash in the first couple of weeks. After Trevor went back to work, it became difficult for me to use the oven and make cookies when I was constantly tending to a newborn and trying to catch up on my own sleep. 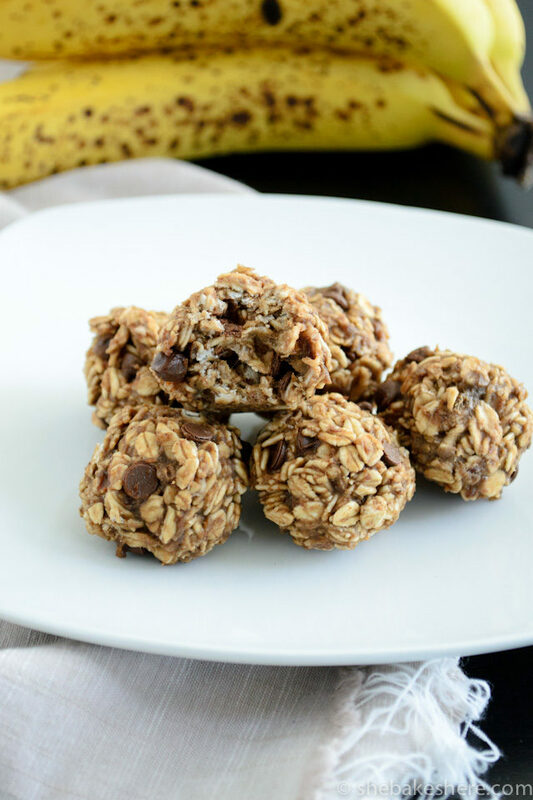 In place of cookies, I developed these no-bake lactation friendly banana bread energy bites. 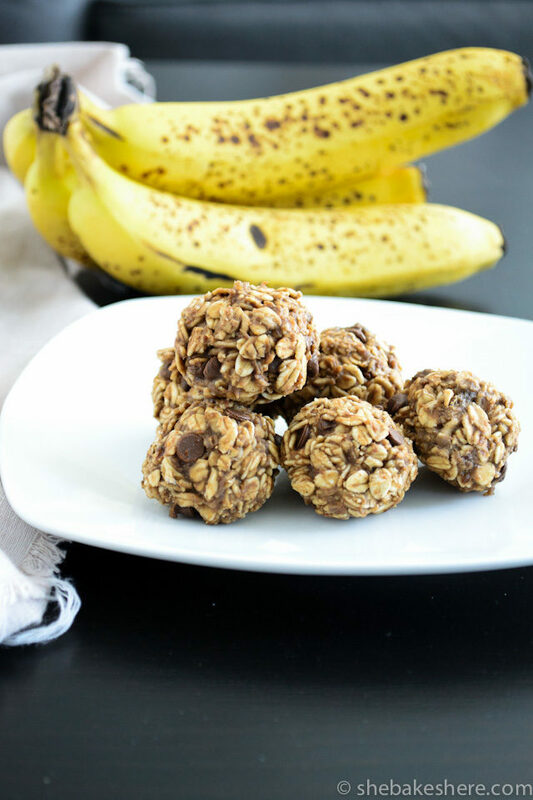 They ended up being a huge lifesaver because they only take 20 minutes to prep (which is as long as Thomas likes to nap on his own these days) and they are a great way to use up ripe bananas. These days, I only occasionally get to make smoothies since our Blendtec is insanely loud, so this is a nice way to use up the bananas that I was otherwise stuffing into our freezer. During my multiple visits to the lactation consultants office, the nurses advised me of some foods that were thought to help boost milk supply for women who are breastfeeding, such as brewer’s yeast, oats, and flaxseed – all of which can be found in this recipe. The nice thing about these ingredients is that they are super easy to find (I stock up regularly at Bulk Barn), but they are also pretty healthy even if you are not breastfeeding. My Dad was even a big fan of these bites when he and my Mom came down to visit earlier this month. It is worth noting that this recipe does contain nuts and chocolate, which can make some babies fussy when it is passed through breastmilk. I don’t have that issue with Thomas, but if it is something you are experiencing with your baby I recommend leaving out the chocolate chips and substituting the peanut butter for a nut-free alternative such as sunflower seed butter. And if you are a new mother with a new baby who is experiencing issues with breastfeeding or infant weight gain, do not be afraid to get help through your family doctor, a breastfeeding clinic, or by seeking out a lactation consultant at a hospital or clinic. The last time I went to see a lactation consultant was when Thomas was six weeks old and although he was significantly older than all the other new babies in the office, it was so reassuring to find out that he was still on track and getting enough to eat. In a medium bowl, mash the bananas with a fork. Add in peanut butter, brewer’s yeast, ground flaxseed and cinnamon and stir with a spatula until well-combined. 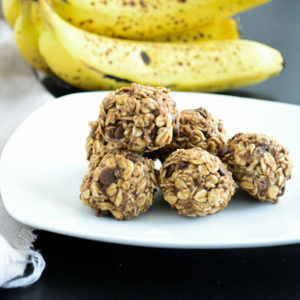 Add rolled oats and mini chocolate chips and keep stirring until the oats are well coated in the banana mixture. Using your hands, shape the mixture into tablespoon-sized balls. The mixture will be sticky but will hold together fine. If some of the chocolate chips fall out, press them into the balls after they have been shaped. Store the energy bites in an air-tight container in the fridge and let them rest for two hours to firm up and to allow the oats to absorb the moisture. Enjoy straight from the fridge as a quick snack. This recipe brought to you by She Bakes Here.